Field workers on the Wood River Wolf Project have spotted a breeding pair of wolves in the southern Wood River Valley, the first this year and the only confirmed pack in the area. "We knew that there were wolves in this area, and we went to confirm," said Patrick Graham, field crew leader for the Wood River Wolf Project. "We did some howling and got a response back." Graham said he didn't see the pack, only heard them and confirmed the pack's existence through audio recordings. The pack is made up of a breeding pair of adult wolves and several pups, though the exact number could not be confirmed. "We do know there are pups, because they have such distinct sounds," Graham said. "They kind of yip and bark. It's a little reminiscent of a coyote. The mature wolves are more orchestrated." Graham said one mature wolf approached the group through underbrush and barked the crew away from the ridgeline. While he didn't see the wolves, Graham said crew member Peter Haswell did catch a chance glimpse of one pup. "It was literally for a split second," he said. "We didn't want to approach too closely." Haswell could not be reached for comment, but Suzanne Stone, spokeswoman for advocacy group and project sponsor Defenders of Wildlife, said this was the first live wolf Haswell had encountered. "Peter called me that night and was just elated," Stone said. "He said, 'Why didn't I come to Idaho years ago?'" Graham said that though he couldn't tell what color the wolves were, he didn't think they were related to the former Phantom Hill pack, a group of black wolves that occupied territory north of Ketchum before the hunting season in 2009. The pack's connection to an incident last month at Cove Creek Ranch near Bellevue, where at least two calf deaths were confirmed as wolf kills, is unclear. "It's kind of hard to say," Graham said. "Just from the facts we have, there could be a connection, but it's really hard to confirm that. There's so much terrain in that area." Todd Grimm, district manager for Idaho Wildlife Services, said the Cove Creek wolves haven't returned to the ranch since the incident. "I think we've pulled our traps there," he said. "No sense having equipment on the ground that isn't doing anything." Graham said his group hasn't been able to determine whether there were other packs in the area that could have caused the kills. Stone said the Little Wood River basin had a pack living there and likely still does, and estimated there were three groups in the region that were in the Wood River Valley at least part time. Stone and Graham both declined to state the exact location of the pack, saying only that it was between Hailey and Bellevue toward the Pioneer Mountains. "They're in a really vulnerable spot," Stone said. "If someone decides they don't like having wolves around, it would be easy to go in and take them out." 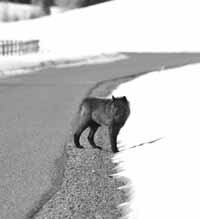 The wolves are near grazing land in the expanded area of the Wood River Wolf Project, Stone said, and will likely encounter livestock this year. Graham said discovery of the pack doesn't change much about how the project will operate. "It just heightens our awareness," he said. "We'll make sure to prioritize our resources in that area."